Here is information on how to apply for a Taiwanese visa in the Philippines. I actually had to apply for one despite supposedly being exempted since my trip last year happened when relations between Taiwan and the Philippines were a bit shaky for a few weeks. - Other supporting documents if required such as SSS contribution lists, pay slip, etc. 10 Visa fees are Php2,400.00 (Single Entry) and Php4,800.00 (Multiple Entry), payable upon filing of application and are non-refundable. 12: Filing Time is 8:45 to 11:45 a.m. from Mondays to Fridays except holidays. Releasing Time is 1:45 to 4:45 p.m. Mondays to Fridays except holidays. 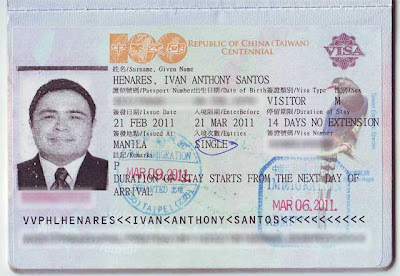 Effective March 15, 2011, Philippine passport holders may apply online for an Authorization Certificate for visa-free entry to Taiwan for up to thirty (30) days. Those eligible for visa-free entry are passport-holders with valid visas or permanent resident cards of the United States, Canada, Japan, United Kingdom, European Union (Schengen), Australia and New Zealand, provided that they have never worked in Taiwan as blue-collar workers before. Qualified applicants should register their passports and personal data at the website of the National Immigration Agency of Taiwan and apply for approval. Upon obtaining approval, print out the Authorization Certificate and show it to the airline check-in counter. Remember that the Authorization Certificate must be presented at Taiwanese Immigration together with the valid visas or permanent resident cards. Failure to do so will lead to prohibition from entering Taiwan. Wow what a nice post.I am impressed from it. nice posting, thank for information. What are examples of this documents? very informative. thanks so much. With regards to the exemption, does it mean if I already traveled to Japan and Europe [ so I got Visas - Japanese and Shengen stamped on my passport ] I should just register my passport online? Would really appreciate it if you can clarify this. No, valid means the visas have not expired. So if you've used them, and they're not multiple entry visas, they're no longer valid. Is the "visa-free" been lifted and we again apply for entry with a valid US multiple entry visa? How do we know if we need to apply manually like you even if we have US Visa? The online app is not approved? what are the Supporting documents related to the purpose of visit?like?since my purpose there is to visit my husband who's currently working there and to have a vacation.? In protest over the unjustifiable deportation of 14 Taiwan nationals by Philippine government to mainland China, Philippine nationals are no longer eligible to apply for an authorization certificate for visa-free entry into Taiwan. Uhm, that was 2010, and just for two weeks or so. I should know, I got affected by the suspension. Back to normal. I got into Taiwan last year on a US visa. Hi! If we get a visa, should we leave for Taiwan right away? I know some countries require you to leave within a month or so after getting a visa. Our trip is scheduled for April and we don't know if we should apply now or later. Hi can we submit ITRs only? Or is it really required to shbmit your bank statemens? Where are we going to pay for the fees? Is it when we submit the requirements in rcbc? Your reply would be so much appreciated! Thanks! how can i find a agency for fixing my visa cause i don't e a time for it. I really need help thank you..
Hi Ivan. Just a clarification. For valid US visa holders, when is the appropriate time to file for the Authorziation Certificate online? Must it be at least 30 days or within 30 days prior to arrival in Taipei? When does the 30-day period reckon? Thanks. Thank you! Very concise post. Just want to ask, if it wasn't mentioned yet, how soon should I apply for the visa? I'm leaving in Sept yet. TIA. God bless! Hi Ivan,. I plan to visit Taiwan for 3-4 days. I'm currently based in Japan. I'm having the long-term resident Japanese visa, not the permanent resident visa. Am I exempted? My purpose to go to Taiwan is just for sight seeing, do I still need to submit all the requirements/documents??? Hi Ivan. I'm planning to visit Taiwan sometime in May for 3-4 days just for sight seeing. I'm currently based in Japan holding a Long-Term Resident visa not a permanent resident visa. My visa is valid for 3 years. Am I exempted? Because my visa totally different from Permanent visa. Do I still need to submit all the requirements/documents needed? I want to apply the online visa application as you've stated granting that my Japanese visa will be valid. Hi Ivan, I'd like to ask if they will return the original documents to me? Because they're asking for my original documents, but I only have one copy of those. Please reply. Thank you. Hi sir we will be travelling for taipei on oct 10,2013 until oct 15 and fortunately the ban for online applic was already lifted. We are US visa holders to expire yet in 2016, will it be ok if we apply online on Sept. 20 or on a later date! Is thevapproval of said certificates minutes within the application online? Thank u very much. We really need your advise.